Be the first to share your favorite memory, photo or story of Hilda. This memorial page is dedicated for family, friends and future generations to celebrate the life of their loved one. Hilda Deane (DeHart) Scholler, 98, of Spring Green, died peacefully at home on Tuesday, April 9. She was born on February 19, 1921 in Hartford, IL, the daughter of Gilbert and Clara Marie (Beebe) DeHart. Hilda met her husband of 49 years, Frederick R. Scholler at a dance at Chanute Field where he was stationed. He offered to teach her to dance which led to years of “poetry in motion” on the dance floor. She was the first person in her family to graduate from college (Illinois State Normal University) with a degree in Health/Physical Education and English just three months after their marriage. She was the first married teacher in the Champaign/Urbana School District and later the first pregnant one. She was invited to move in with her new in-laws, Dr. and Mrs. Alphonse Scholler in Chicago while Fred was away at war. Daughter Susan and son Bruce were born there while the two families shared a two flat for the next 13 years. Hilda threw herself into many activities especially ones involving her children. She was a PTA president, Cub Scout leader, President of the Legion Auxiliary, subbed in the Chicago Public School system and worked in the credit department at Sears. In 1959, the family bought their first home in Schaumburg, IL a rural German farm community. She started subbing and soon signed a contract to teach 4th grade at Blackhawk School where her son called her Mrs. Scholler. Later, she returned to teaching physical education until she took a Leave of Absence, and rented an apartment in DeKalb, IL to finish her Master’s degree in Guidance and Counseling at Northern Illinois University. Husband Fred visited on weekends. Following her graduation, she returned to the school district as an Elementary Guidance Counselor working in classrooms and with small groups of students with problems using Charlie Brown and his pals. In 1967 she was invited to become a charter member of the Gamma Gamma Chapter of DKG, an International Honor Society of Key Women educators. She served as their president in 74/76, was President of the Classroom Teachers Association, Secretary of the APGA and the site chair for a national convention. In 1980 the couple moved to their summer home in Spring Green where they threw themselves into local activities. They were part of the fledgling group of members of the Spring Green Senior Center where she served as their Board Secretary and wrote the Senior Citizen Corner in the Home News until 2009. Hilda and Fred, and later with her son and daughter enjoyed every outdoor play at APT until 2017. She raised funds for the building of the Spring Green Library and served on the board of the Friends of the Library. She ran the Easter Egg Hunts at the Springs Resort as a library fundraiser. 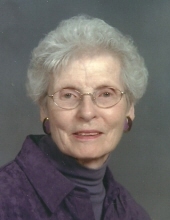 Hilda was very active in the life of Christ Lutheran Church as the Secretary of the Worship Committee for 20 years, co-chairing the Altar Guild, serving on the CLCW Board, ushered, trained all of the acolytes, and was a convention delegate several times. Hilda transferred her Delta Kappa Gamma membership to the Lambda Chapter in Richland Center where she participated in a wide range of activities. When the chapter celebrated its 50th Anniversary she took daughter Susan to the celebration to hear the first female chancellor at the UW. At her death both Hilda and Susan were members of the chapter and shared secretarial duties. Hilda and Fred enjoyed a number of trips together around the world and it was in Switzerland where their travel together ended with his sudden death. She then began to travel to DKG conventions with her daughter and in 2000 they joined several hundred high school music students on a European trip across seven countries. Hilda read to the 4K students at Lincoln School as part of the Lambda Chapter Guest Reader program, did water aerobics three times per week and enjoyed quilting, stenciling, painting, and all types of arts and crafts. She was a member of the Sauk and Richland County Retired Teachers and the Rolling Hills Toastmasters. She is survived by her children, Susan (Joseph) Tatar and Bruce (Sally) Scholler, three grandchildren, Anthony (Heidi) Tatar, Andrew (Jennifer) Tatar, Joseph II (Raquel) Tatar, five great grandchildren, Nathaniel, Zachary, Lucas, Adelyn, and Oliver, three nieces, Marie Anne Reyne, Martha Maynard and Marilyn Loraine. She was preceded in death by her husband, her parents, her sister Jane Esther (John) Stout, two nieces, Marjorie (Leland) Beckham, Kaye Loraine, and her eight-year old granddaughter, Judith Tatar. Funeral services will be held on Wednesday, April 17, 2019 at 11:00 A.M. at Christ Lutheran Church in Spring Green. Pastor Kirsten Curtis will officiate with burial in the Big Hollow Lutheran Cemetery. Visitation will be held on Wednesday at the church from 9:00 A.M. until the time of service. In lieu of flowers, Memorials may be made in Hilda’s name to Christ Lutheran Church, 4PeteSake or the Friends of the Spring Green Library. Online condolences are available at www.staffordfuneralhomes.com. The Richardson-Stafford Funeral Home is assisting the family with the arrangements. In lieu of flowers, memorials may be made in Hilda's name to Christ Lutheran Church, 4PeteSake or The Friends of the Spring Green Library. "Email Address" would like to share the life celebration of Hilda Deane Scholler. Click on the "link" to go to share a favorite memory or leave a condolence message for the family.